Meesha Media Group creates high-impact social media strategies that improve the effectiveness of your online presence. We produce, develop, and maintain your social media marketing with the latest tools. From determining which social media tools work best for you, to measuring the impact of each campaign, MMG provides our signature “thoughtful quality” to your social media needs. UNCF Special Programs Corporation (SP) works diligently to create connections between the diverse, high-performing workforce of the minority education community and private industry to address the nation’s imperatives. The goal of SP is to provide Minority Institutions (MIs) with capacity-building opportunities; the government and private industry with access to a talented and diverse workforce; and individuals with the experience, exposure, mentoring, and development they need to have successful and empowered careers. To engage with SP’s target audience (MIs, government agencies, private sector) via social media networks and foster an online community. To develop an engaging online presence to promote SP programs, activities, and news. To create a collaborative environment for SP constituents to satisfy the development of long term partnerships between MIs, government agencies, private sector, and the media. To stay abreast of social issues affecting target audience by monitoring social media. After extensive research we narrowed down which social media tools would best reach SP’s target audience. We created profiles on Facebook, Twitter, YouTube, LinkedIn, and WordPress. 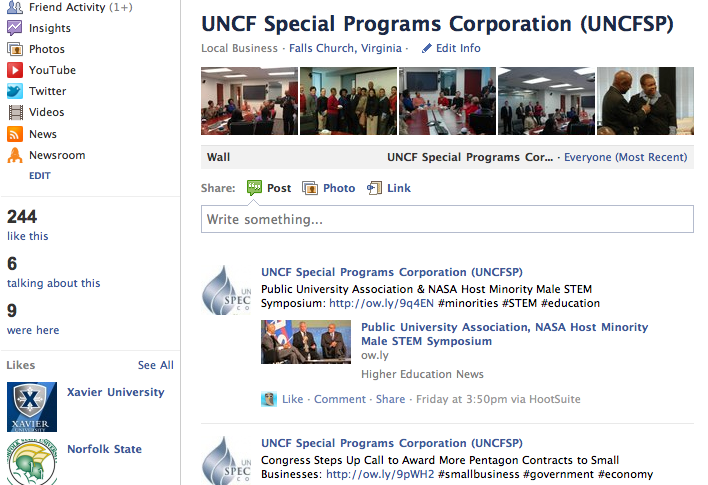 We developed a social media strategy that enhanced SP’s overall goals: The goal of UNCFSP is to provide Minority Institutions (MIs) with capacity-building opportunities; the government and private industry with access to a talented and diverse workforce; and individuals with the experience, exposure, mentoring, and development they need to have successful and empowered careers. To provide Minority Institutions (MIs) with capacity-building opportunities: We incorporated weekly posts on each social media tool about MIs and the steps they’ve made to improve their capabilities. We also aggregated content from SP constituents who benefit from government funded SP assistance. We promoted a number of MMG produced videos about these opportunities and their successes via social media. The government and private industry with access to a talented and diverse workforce: We acquired a few hundred MI students and faculty on each social media tool, and encouraged them to provide content to the SP Blog or to weigh in on relevant online discussions. In doing so, students and faculty touched upon the issues that affected their institutions or their peers in the job market. Students and faculty apart of SP’s online networks were given exclusive access to internship, and fellowship opportunities, and webinars and training sessions. Government and private industry apart of networks were able to discern student and faculty needs and successes from being engaged on SP’s social networks. And individuals with the experience, exposure, mentoring, and development they need to have successful and empowered careers: We created daily posts about gaining experience through internship and fellowship opportunities for minority students. We promoted opportunities not only came from SP but from similar organizations a part of SP’s online community. We highlighted fellow and intern experiences and exposure through a number of blogs either created or edited by MMG. We provided a number of professional resources to SP’s online community, including the creation of a talent database. The overall strategy included various mechanisms to communicate SP’s stance on a number of topics relevant to the target audience. Such mechanisms included writing blogs about the topic, engaging in dialogue with followers, and reposting news stories and statistics to support SP’s views. Thus far, SP has garnered 230+ fans on Facebook, 320+ Twitter followers, 300+ blog visitors, and 3,800+ views on the YouTube page. We are confident that this ongoing social media project, along with a future wide-scale launch to SP’s constituents, will garner more views and follows.